With two HomePods in my house (so far) I have moved on to giving them the keys to as much as possible. My second step was to deploy Lutron smart switches to replace some Hue bulbs. Hue bulbs are excellent. They are responsive, last a very long time over traditional incandescent bulbs, and have a pretty good app. What I don't love is that I have to cover every physical switch in my house because if you turn off power to a Hue bulb they magically stop working. This isn't a terrible problem for hidden switches but in the main travelways of my house my walls started to look like some sort of nuclear launch panel. The Lutron Caseta switches are a consumer product. There's several models available to match the design of your house and many different wall plate options. Importantly, these are physical switches with remotes. With at least one physical switch, it means I'm not dependent on a hub, or WiFi, or even a piece of software to operate my lights. The Lutron Caseta switch comes in two major flavors: a dimmer and a toggle. The dimmer has a programmable favorite setting button in the center with up and down dimmer buttons. The Caseta dimmer has a nice smooth dimming transition which I think is a better effect than most dumb-dimmers. The toggle switch is either on or off. Each Caseta switch can be paired with one or more remote switches. These remotes are mounted to a wall to look like a physical switch but can be stuck pretty much anywhere. So if you always wanted a second or third switch on a wall, this is a great option. Lutron also has an iOS app which is useful for initial setup but I've barely used it beyond that. The Lutron app does have controls for automation that feel familiar but there's not much there that isn't in the Apple Home app. I use Siri quite a bit with the smart switches but one thing the Home app accomplishes for me is sunrise and sunset automation. Before Lutron I had a terrible in-wall timer that scheduled my porch lights to turn on and off. Of course a timer has no concept of day light so for most of the year the lights are either on or off at the wrong time. I don't use the Eve app. Instead, I use the Apple Home app for the setup and control. With newer HomeKit compatible appliances, setup is very easy. I just had to aim the camera at the HomeKit code on the plug. Wiring up a Caseta switch can be pretty simple for a single-pole (one switch) configuration. The instructions are easy to follow and well written. For most multi-pole installs you just wire all but one switch to be permanently "on" and place remote battery-powered Lutron switches over them. One switch will be wired. There were two "gotchas" for me. 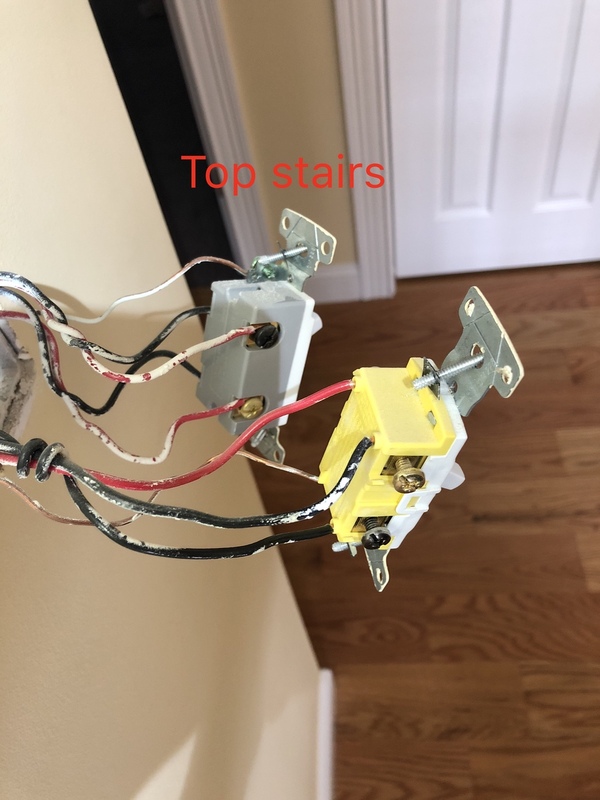 The first was a three-gang install that had wiring I couldn't figure out. I called an electrician because I don't want to be incinerated in my sleep. Before removing a single wire, I snapped photos and labeled them. Then I stored them all in DEVONthink for reference. My experience has taught me that getting one switch to work doesn't mean anything. I had to rewire several times before everything worked as expected. Reference photos are a life saver (literally). The second issue has to do with L.E.D. lights and dimmer switches. L.E.D. lights are not all created equal. Like incandescent bulbs, L.E.D. bulbs have varying voltage requirements and the Caseta dimmer switches don't work with all of these bulbs. I have a chandalier lamp with tiny candle-like bulbs that use very little juice. These are not really dimmable so when I put a dimmer switch on that circuit the light would not turn off. I had to swap for the Caseta on/off switch. Even then, the bulbs stay on but at a very low (and quite pleasant) level. I marked that task as good enough and moved on. I had a large number of non-dimming L.E.D. BR30 bulbs in my house. With a Caseta dimming switch, I could dim the light but the bulbs buzzed and occasionally flickered. I wasn't surprised but the fix was easy. I switched them all for Philips compatible bulbs and was very happy with the results. Inexpensive L.E.D. bulbs are very good now and these Philips bulbs put out a warm light with a good spread. I wanted a motion detector for a back hallway. Not so much for security but to trigger a light when I come home or when we use a bathroom at the end of the hallway. I chose a a Philips Hue motion detector for about $40. It worked great for about a week. Then it spontaneously decided to pair with my bedroom lights. You can imagine the surprise when I wake up at 4 A.M. and wander through that hallway with my wife asleep upstairs. It's not a magical experience to turn on the bedroom lights before dawn while your spouse is asleep. Or so I've heard. Several times. It's experiences like this that is souring me on the entire Philips Hue line of products. The Apple Home app and the Philips Hue app have a subtle tug of war between devices that shows the rough edges of HomeKit. I also purchased an outdoor controller for some holiday lights by iDevices. I've used timers in the past and they regularly failed. My hope is that using HomeKit to trigger at sun up and sun down will be more reliable and make me feel a little more festive. The iDevice outdoor controller is about $50 but it provides two sockets and doesn't need a hub. I mentioned the sunset and sunrise automations above. These are "set it and forget it" programs that save me some headache. It's the Siri control of my lights that makes this all worth it. I like the Caseta switches because they are still just normal switches. It made it easy to get my family involved with the system because they were able to continue their life with almost no interruptions. But, that was my way in. After three months everyone in my house is using Siri (through HomePod) to turn lights on and off. They are using HomeKit scenes for the first time and they love it. I created a couple of Shortcuts triggers for scenes everyone can use.2 The "I'm Awake" trigger turns on the bedroom, hall way, and kitchen lights to 20%. It's so nice to walk through the house in the early morning without the full glare of the lights. The "It's Bedtime" shortcut turns off all of the lights in the main part of the house, and turns on the hallway and master bedroom. We no longer forget to turn off kitchen lights at the end of the day. That's the whole point of these HomeKit systems. They reduce tiny inconveniences in ways we didn't plan but still find to be a relief.